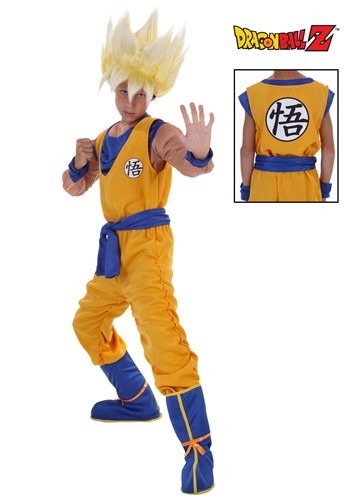 Child Super Saiyan Goku Costume By: Bayi Co. for the 2015 Costume season. Does your kid face off against the likes of Frieza, Cell and Majin Buu on a daily basis? Then isn't it about time he went Super Saiyan on them? It used to take tons of training in intensified gravity and heavy emotional stress to change into a Super Saiyan, but these days, all it takes is this officially licensed Dragon Ball Z costume. The yellow tinted suit lets the bad guys know that you're powered up and ready to go... over 9000!